To answer the question you ask at the end of your post “NO!” as you stated we are in an election year and the only goal in the minds of all politicians in Puerto Rico is to get elected no matter what! Principles go out of the proverbial window. That’s why the majorities of the people in the island are confused and believe whatever any of the politician’s state. No wonder the US Congress does not know what to do with the island and, more importantly, with our people. We claim that we are Americans, and we are! Because we are geographically in the Americas. And due to the fact of the Treaty of Paris of 1898, and the subsequent laws enacted by US Congress, second class United States citizens. As long as we, Boricuas, want to remain such an anachronism in the hemisphere, the local politicians will keep on getting away with the proverbial “murder” of our culture and well being! Thanks for the reply, Angel. You are spot on. I couldn’t have said it better myself. Hey, maybe Texas should have their own Olympic team, too. After all, they were a separate country once, and a colony of Spain at one point to boot. 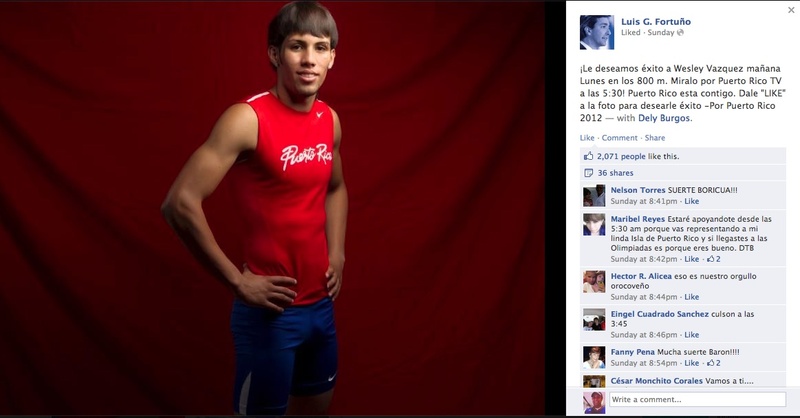 He is trying to show that Olympics sports are not threatened by Pto Rico becoming a state. And he might be right as Hon Kong, now part of China, was able to keep its Olympics sports franchise. Olympics franchises are private, not a state matter. To compare Hong Kong as a state of China does not compare to PRico and the US. Also, Curacao became part of Holland and now there is no Curacao Olympic team. But continue to believe the illusion that if PRico were to become a state, the United States would allow for its newest state to have its own Olympic team. It is not going to happen. You can quote all the Olympic charters you like, in the end, it is the price you pay to become a state. In London, 29 athletes and three coaches who call Florida home will compete at the Games of the 30th Olympiad. Governor Rick Scott and First Lady Ann Scott call on Floridians to join them in watching and supporting Florida’s members of Team USA as they represent the Sunshine State and the United States. The Olympic Games begins today, Friday, July 27, with the Opening Ceremony, and competitions continue until Sunday, August 12, with the Closing Ceremony. You miss the point. Florida doesn’t have its own Olympic Committee. Sorry, nice try. Seems you are the one who is making this a political issue. He’s a governor like Scott who is proud of his athletes. If his message is to show he would have pride for PRican athletes whether or not they are part of a bigger team (USA) then I hear him loud and clear! If there were a Florida Olympic Committee, your point would be valid. But there is not. So it makes no sense to me, sorry. But thanks for the comment! So let’s have a California Olympic Committee, a Texas OC, an Illinois one, once Puerto Rico becomes a 51st state. This is a pure play for votes in an election year. Fortuño is an opportunist just like every PRican politician out there. My point was about the Governors message which you questioned. I’m not sure why you keep bringing up an Olympic Committee. Because if Puerto Rico were to become a state, there would be no more Olympic committee and there would be no more Olympic team. 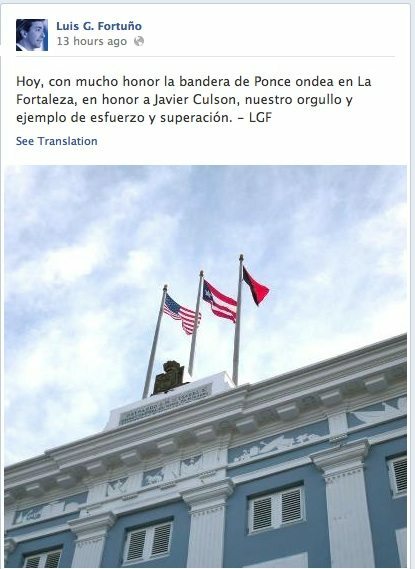 Also, Fortuño and the PNPers are the first to say that the PPD and PIP exploit the boricuaness for political gain and here is Fortuño doing the same thing less than 100 days before an election. It is pretty shameless. Bruce, if my sin is to be told that I think Governor Fortuño is a political opportunist and lacks real political courage and just plays the “Viva Puerto Rico” card when it is politically convenient and then the “Viva the USA” when he needs it, then I will be an eternal sinner. LOL. You can keep defending the Governor, he is still a typical political con artist like all the rest who have put their political interests in front of the island’s interests. It’s a sad political game that has been going on for decades and Fortuño plays it as well as anyone else who has led this island. MYRISA me causo mi risa,flyboy56 no es realista (en PR todo es politica) Lo unico que logramos con la Esdtadidad en PR es que nuestra representacion en los deportes serian los estadounidences y entonces podriamos ser tan arrogantes como ellos! So you believe most voters do not know what they would be giving up if Puerto Rico does become a state? Losing their Olympic Committee being one of those “cultural” rights… And the Governor is using this ignorance to his political advantage? Do you think the President’s decision to back gay and lesbian marriages and helping some of the undocumented immigrants as a political ploy? Or is it possible he believed his decisions to be the right thing to do? yes, Bruce, that is what I am saying and yes, I also think President Obama is also making political moves as well. This is not about the President. This is about how the PNP is all of a sudden backing the “cultural” thing for convenience. BTW, Puerto Rico would get swallowed up by the USOC. The current version of the Act was sponsored by Senator Ted Stevens, then–United States Senator from Alaska, and adopted in 1998. It is a revision of the previous Amateur Sports Act of 1978 that reflects changes such as the fact that amateurism is no longer a requirement for competing in most international sports, expansion of the USOC’s role to include the Paralympic Games, increased athlete representation, and protection of the USOC against lawsuits involving athletes’ right to participate in the Olympic Games. If it is true Julito, and most voters do not know they would lose their Olympic Committee if the US became a state, then what makes you think PRico would do well as an independent country? I personally do not believe PR is ready for independence. The education system is in deep trouble, not enough pro-business government policies, isolated from the many resources needed for manufacturing which is what stymied Japan, and a culture that does not promote a responsible work attitude which I’m sure you can relate to after living and working in the US. As for allowing professional athletes to compete, I just wonder why it took so long for them to change that policy. Many other countries used professional athletes in the olympics. So why shouldn’t we? The next thing that needs to be changed is allowing private companies operating overseas be allowed to pay government officials ” operating fees” so they can compete with other countries who are allowed to pay these bribes. But that is just my opinion. We might also consider getting rid of the Geneva Convention and fight the way our enemies fight. But that is just my opinion too. flyboy la verdad es que no te entiendo,” I personally do not believe PR is ready for independence. The education system is in deep trouble, not enough pro-business government policies, isolated from the many resources needed for manufacturing which is what stymied Japan, and a culture that does not promote a responsible work attitude which I’m sure you can relate to after living and working in the US”… O sea entiendes que la union a E.U no a funcionado. y Precisamente ese es el problema,mienra los Estados Unidos sean quienes gobiernan en PR (o sus marionetas).nada cambiara, Puerto Rico necesita un cambio radical y poder tomar decisiones que no dependan de el apruebo de E.U(para su comveniencia)Que la educacion sea para todos y gratis,que se controle lo que entra y sale. se le de prioridad a la agricultura y que la dignidad y el orgullo tenga mas valor que el dinero, (Cuba lo hace) y si mencionar a Cuba te asusta,esa es la respuesta a tu falta de optimismo a nuestra GENTE y BELLA ISLA, pero te doy las gracais por que aunque equivocado te preocupas…. Cubans risk their lives trying to get to the US for a better life. And that is all I am going to say about that. The US does not need to be defended. We’ve proven ourselves to be world class leaders regardless of the tough struggles we are going through right now. The fact remains that Puerto Rico has NOT have the opportunity, and I will go on a limb here by stating that it appears, at least by Gen. Miles declaration of July 28, 1898, (“No hemos venido a hacer la guerra contra el pueblo de un país que ha estado durante algunos siglos oprimido, sino, por el contrario, a traeros protección, no solamente a vosotros, sino a vuestras propiedades, promoviendo vuestra prosperidad y derramando sobre vosotros las garantías y bendiciones de las instituciones liberales de nuestro gobierno.”) that some kind of independence was to be granted. Yet at the Treaty of Paris on December 10, 1898, the United States forces Puerto Rico, Guam and the Philippines to be ceded by the Spanish Court of H.M. Alfonso XIII. However, Cuba is to be a free country. In all fairness it boils down to what we as Puerto Ricans will be and are willing to do. No problem is insurmountable and there are risks as you point out with the current Cuba situation. We have not experienced the opportunity to explore and educate ourselves by being an independent country. We can work out all the issues. We can not erase the 114 years of US colonialism overnight just like the 405 years of Spanish colonialism have not to this day being completely eradicated. If independence is such a bad word for some I’m glad and proud that Washington, Franklin, Jefferson and the rest of the US Founding Fathers did not thought so. Also, in my opinion, we should at least be given the same political status that we enjoyed in 1898, that is autonomy. We (Puerto Ricans) have proudly served in the US military, US government and enjoy our citizenship. I have read statement by Gen. Miles over and over again Angel and have not seen anywhere in his statement where he states any kind of independence would be granted to Puerto Rico. He claims the US will bring protection which it has. Promote you prosperity which it has thanks to US tax payers, and and bestowed liberal institutions such as welfare, food stamps and unemployment. Of course PRican taxpayers have had to pay into these liberal institutions which is the right thing to do. But no where in his statement does he promise independence. Unfortunately for you and many of your independence minded organizations, most Puerto Ricans do not want independence. They continue to vote for strong ties with the US and to keep their US citizenship. It’s not me or any American you need to convince Angel. It is the Puerto Rican voters you need to convince. Congress needs to see an overwhelming democratic vote, one way or the other, before they make a decision. I was just merely pointing out some of the characteristics a strong country should possess if it wants to succeed. You do not want to literally take a leap of faith into the unknown with just your pride alone. It depends on what you define as “bestow upon you the guarantees and blessings of liberal institutions of our government.” First, I am NOT and independentista, but I like to play the devil’s advocate. Second, General Miles statement could be interpreted as an annexation statement for Puerto Rico. Granted the United States has done great many things in and for Puerto Rico, and only a crazy person will say otherwise. But, why it did not allow Puerto Rico to be a free country, like Cuba and eventually the Philippines? Why still in this 21st century US Congress still considers Puerto Ricans as Second Class citizens in Puerto Rico? The simplest answer is the economic power the US had and has over PR. The social programs although at a time were much needed, complicated our dependence on them to the point that politicians had and continue to use them to intimidate the voters. I listen to what they say and how they say it. For example social security. I have heard Puerto Rican politicians said that if the people do not vote for the PNP or PDP, we will all loose that entitlement program. Here I will grant you that Puerto Rican voters have not educated themselves or our education system, paid for by federal tax dollars (that you and I pay), have done their homework and teach what is required. In accordance with IRS regulations employers in Puerto Rico are required to collect Federal Insurance Contribution Act (FICA) (Social Security and Medicare taxes) and the Federal Unemployment Tax Act (FUTA). Therefore we will get those funds based on laws enacted by US Congress (Social Security Act and Unemployment Tax Act) and there is nothing that Puerto Ricans politicians, or citizens for that matter, can do about it, unless they run for office from one of the States! So why use this scare tactic? To get votes! And the PIP has said that IF PR was to become and independent country they will arrange for Social Security to continue for those already receiving it as well as military compensation and retirement. It is a fact that US companies had benefited and to some extend still benefit by keeping PR in the status quo. We do need a change, someone has to do what is required and stand firm politically and socially. What brought us into this exchange of ideas were the acts that the current governor of Puerto Rico, Hon. Luis G. Fortuño plays for the masses in PR. I believe that is OK to celebrate and encourage our people in their personal endeavors. And I am of the opinion that everyone should realize that his play was partisan more than anything else. That is what politicians do! Were you able to elect your own governor or did Spain provide PRico with a governor under the Autonomy Charter of 1898? You don’t need to answer this as it is a rhetorical question. The charter clearly states Spain would assign a governor to Puerto Rico which it did. Since the 1950’s PRicans have elected their own governor thanks to the US. I only wish independents would acknowledge that truth. But then again it’s just politics, and we know all politicians lie to their advantage, right Julitio?! Bruce, if you thought that the United States of the late 19th century was benign and was not doing it for its own interests, you lack a true knowledge of US history at the time. The US was like this since the Indian Removal Act of the mid-1800s and its Monroe Doctrine mentality applies here as well. Yes you are 100% correct! The Autonomy Charter of 1897, Title VII, Article 41 states that the Governor is to be appointed by the King (or Queen). My point is that it was a beginning. The most important part of the Charter was Title V, Article 38 that gave PR the ability to trade. It also gave autonomy to the municipalities and representation at the Spanish Court. As for “Congress needs to see an overwhelming democratic vote, one way or the other, before they make a decision.” I am of the opinion and believe that was exactly what was accomplished in 1957, ratified in 1967 and again in 1993. The 1998 was a partisan political ploy from both sides (NPP & PDP) that confused everyone! The upcoming non-binding 2012 plebiscite should not be done at this time. Let us educate PROPERLY our voters before we ask them for a decision. Also, let us be ready and force the issue in US Congress so that it is binding! That is a great answer! If you believe PRicans are treated like second class citizens because they cannot vote for the President and have no voting representation in congress, you should also know why. PRicans do not pay federal taxes. As in the reverse of “no taxation without representation” which came from the Boston Tea Party riot. I agree with you that the US should have left PRico after the 1898 invasion. For reasons only President McKinley knows, the US decided to stay. I consider President McKinley the first imperialistic President. But the fact is the US did not leave, and so now over 100 years later most people here do not want the US to leave as indicated by the many referendum votes over the years. As for educating the voters on the status selections and what they mean is an excellent idea. One that I have been pushing for over a year now. Especially the Enhanced Commonwealth status some people refer to as Free Association. Where are the leaders who should be at the fore front in educating the voters? Personally, I think most everyone prefers to keep things the way they are because it keeps the beny’s rolling in and the culture can be maintained. And more importantly, retain US citizenship. What other status provides all of these benefits? What I was trying for you to consider is that, in my opinion, taxation is exactly what we need! Obviously that will give us the representation (Voice and VOTE vs. just voice). In 1900, 1917 or 1957 that is what US Congress should have done! When we move to the Continent we all pay taxes. If you do not the IRS will let you know and even charge you more! (Arrears and interest) As for President McKinley been the first imperialist president, lets agree to disagree. I am of the opinion that before him and since him we had other imperialist presidents. However, specifically in your view that he was imperialistic, at least to me it does not make sense since it would have implied that he would want Puerto Rico, Guam and Philippines to become states to secure them to the Empire which he did not do. The US is not, and never has been an Empire. We have always been a Republic. It is a government that is empowered by the masses. America’s founding fathers made sure the United States was not ran by Kings and Queens as it was in England or a dictator. A democratic country uses the popular vote whereas the US Republic uses the Electoral College. This method is used to prevent the masses from voting emotionally instead of logically. Chaves of Venezuela and Hitler of Germany were both emotional popular vote winners which changed democracies to dictatorship style rule. As for President McKinley, he did not want Puerto Rico, Guam or the Philippines to become states. To be an imperialist only means an over reaching power by one nation over another and to enforce it’s rule of law. As for federal taxation, it can only happen if Puerto Rico becomes a state. US territories cannot be taxed by the US government. The status quo is the only solution that has been enacted in PR. I agree with you in that “most everyone prefers to keep things the way they are because it keeps the beny’s rolling in and the culture can be maintained. And more importantly, retain US citizenship. What other status provides all of these benefits?” In the final analysis we all need to seat and consider all the options. However, we are dealing with humans and as humans they get a little emotional (more so in this issue). You and I and others can probably start by continuing to share as we are doing right now. When I was stationed on the Daniel Webster (SSBN-626Blue) my XO always said, “Either you are part of the solution or you contribute to the problem!” Operating a nuclear reactor, on a ship designed to sink, you always wanted to be part of the solution no matter what! (The number of “Submerge the Ship” must be less than “Surface the Ship”!) We need to talk to others in the island as well as in the Continent. Keep the flame up. The time is now! It seems we have gotten off the topic of PRican Olympic Hypocrisy. I will say only this; forget about the politics, forget about your own personal views on this topic, and be courteous enough to allow the athletes to have their well deserved place in their moment representing their country. It is about the athletes, and only the athletes. It is not about the political leaders or any of the partisan hacks out there who want to make it about politics. We agree, that it was why I wrote the piece because the Governor wanted to make it about himself. All good! 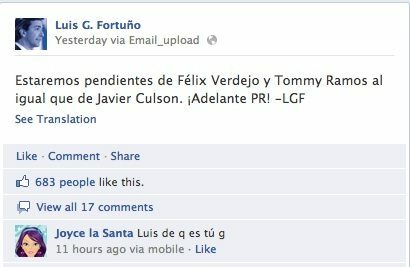 Fortuno was only doing what is expected of a Governor. And many of the families were proud to see their son’s and daughter’s and such photographed with Fortuno. It will forever be a family keep sake. Lol yeah like that little girl in the picture who looks scared? Come on, don’t be a buzz kill LOL! I am actually not from an opposing political party, as you claim. That is the problem with Puerto Rico: people quickly go into partisan camps and get all upset. But the fact is that the esteemed governor is trying to pull another fleece job yet again. If you want to believe it, it is your right. Have a great one! Your saying the Independence party does not oppose the Republican party? I can’t wait to hear your interesting take on this Julito! I want true transparency in PRican politics and not the failed system that has plagued the island for decades. All of the island’s parties have failed. Spoken like a true politician. Providing an answer that doesn’t answer the question. Here is how it should be answered. When I am asked I say I am a Republican who would like to see PRico become Freely Associated with the US. I would also like to see each of the island parties disassociate themselves from statehood, commonwealth and independent status and let that be an entirely separate issue from each of the party platforms. Why can’t you be a Democrat and still want statehood for PRico like the Resident Commissioner? You are one rare Republican! Good for you! That’s not to say I will vote for Free Association (Enhanced Commonwealth?) this November. I will most likely vote No on the first question if I even vote at all. Why should I waste my time going out and voting when my tax dollars are being wasted on lazy government officials who won’t even take the time to lay out a real plan as to how Free Association would look like. I’m surprised you aren’t complaining about their failure as well Julito. But then again it is your party who failed to act. Let your friend Sr. Jose Ortiz Daliot know how disappointed I am. I have blogged about it a long time ago you just didn’t read the posts. So here it is the middle of August and guess what? Still have not heard anything from ALAS concerning the Free Association option in this November’s Referendum. Do you still think there is time to educate the voters? I guess we shall see come November. Reblogged this on Lilly1949's Blog.